There’s a lot to love about Allen Steele’s Arkwright. I’m a little in love with it myself. The story follows Nathan Arkwright and his family. 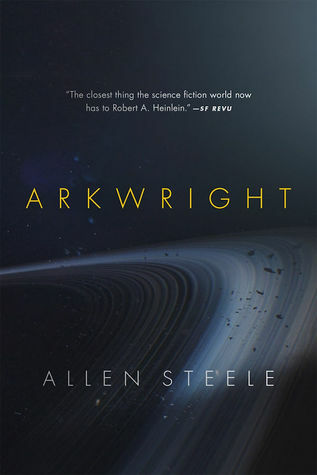 Arkwright is a fictional contemporary of Heinlein, Clarke, and the golden age authors in SF. He’s best known for his Galaxy Patrol stories, a pulpy SF series that would, in his universe, help inspire young readers to go into the sciences, become astronauts, and generally love fiction and reading. When Arkwright dies, estranged from his family, he leaves his estate to the newly established Arkwright Foundation. The Arkwright Foundation, led by his granddaughter, is committed to taking humanity into space and interstellar travel. The book is broken up into three parts: Nathan Arkwright’s history, the development of the Arkwright Foundation and its mission execution, and the results of the interstellar travel. As a result, I want to talk about the book in parts. Nathan Arkwright’s history is easily my favorite part of the book. It composes the first third and is an homage to the golden age of SF. It’s beautiful. Absolutely beautiful. If all you read is the first third of this book, it will have been well worth your time. Nathan Arkwright’s history recounts the Futurian movement in SF, a push to use SF as a means of talking about social and scientific change as opposed to simply a means of entertainment. The Futurian movement in SF caused an actual break in the SF world at a New York convention in 1937. Arkwright is caught up in the split, but doesn’t feel at home with either side of the movement. As a result, he observes the dynamic and interacts with the likes of Arthur C. Clarke, John W. Campbell, and Robert Heinlein. It’s basically the coolest alt history/fanfic ever. Note: If you want to read more about the actual Futurian split in SF, you can read The Futurians by Damon Knight and it’s mentioned in Arthur C. Clarke’s autobiography. Nat Arkwright and his friends are fun and likeable. They’re energetic and representative of the enthusiasm for SF and the industry that makes being a part of SF great. The tone matches the time and the characters undergo changes in their lives (WWII, family dynamics, friendships and relationships) and eventually go through the cycle of enthusiast, jaded, and renewed. There’s so much to love here. The Arkwright Foundation comes about after Nat’s death and is led by his granddaughter Kate. A significant part of this section is about the generations that it takes to make interstellar travel actually possible. It’s not overly technical, but is probably a fair description of the time and efforts it would take to make a starship actually work. One of Nat’s descendants describes the family commitment as cult-like. While I could appreciate this part, and many folks have compared it to a generation ship in so far as it takes multiple generations to make the mission happen. There’s definitely a point here. While each of the characters are likeable and I can understand and appreciate the role this section plays, the story feels a bit like the kind of story you write as a kid. You know the one. There’s a mommy and a daddy who fall in love and have a baby. That baby grows up to fall in love and becomes a mommy/daddy and has a baby, so on and so forth into eternity. Each character has a role to play in the mission’s success, but it wasn’t as engaging as I’d like and felt a bit formulaic. Once the ship lands, the story picks up again. The interstellar ship, the Galactique, successfully lands and begins to disseminate new plant and animal life to make their new home habitable. Because of the expense of sending actual adults, the mission collected zygotes to send into space and fertilize upon arrival. Those become the descendants of Nat Arkwright and his allies in space. This section of the book really interested me. It poses the question: if we do send children into space to be born and grow and develop on their own, who do they become? And equally as interesting, are we still human if we change ourselves to adapt to a new world. Evolution and a nature v. nurture are all wrapped up in one here and I thought the results are fascinating. The characters and new social norms are captivating. The development of government and religion– or rather the exploration of what may come to pass– is so interesting. It’s the kind of question I actually spend a lot of time thinking about. To make it better, the new humans have distinct features physically and linguistically. They walk on both all fours and bipedally. Their language is all computer abbreviations, min for minutes and secs for seconds without knowing the full word. It’s really an interesting line of thinking. I really liked this novel, though I would say it’s U-shaped. Exciting and the beginning and end with a bit of a dull middle. Regardless, you can tell Steele spent a lot of time thinking about the way he uses SF and what there really is to love about it: the future and the changes the future brings. This entry was posted in Reviews and tagged Arkwright Foundation, Clarke, Galactique, generation ships, golden age, Heinlein, history, Nat Arkwright, SF, Space travel.